just before leaving again, my brother shared with me few beautiful songs of a band i didn’t know, called the boxer rebellion. below it’s one of them – both sides are even. i don’t know if i’ve ever told you about one of my favorite not-dutch-not-flemish paintings in the louvre. 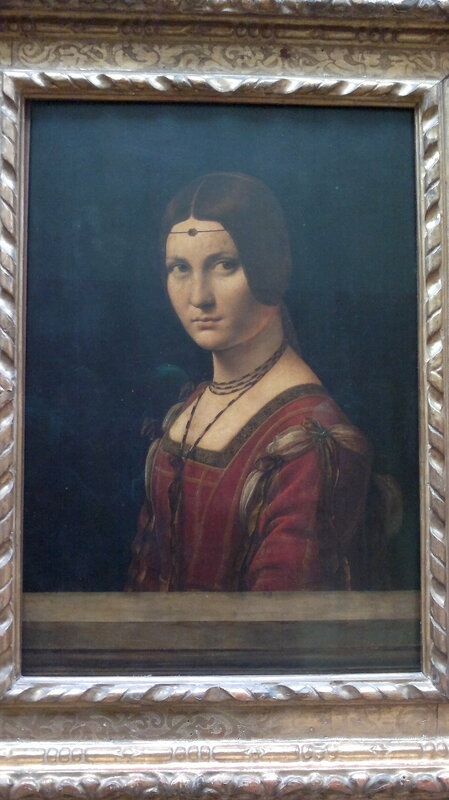 it’s a delicate portrait of da vinci, known under the name of la belle ferronnière. what strikes me the most each time i see it are the following three things: the hypnotizing look of the lady (identified by art historians as two different persons – wife or mistress – of ludovico sforza, duke of milan), the subtleness and refinement of the costume, and the intricate profusion of the shaped – almost carved – volume (which is, nonetheless, so simple). unfortunately, the photo below cannot show any of them right. so, if you have the chance, please go have a look at it. or should i say her?